Lights flashed on, the stands were filled with excited faces. The yearly talent show was a hit for SDA students and families. The hosts, sophomore Adrian Thierry and freshman Niya Mustafa walked out to welcome the anxious crowd. They handed over the microphone to the first act. The show was on. Last Night was the 2019 SDA annual talent show, complete with singing, rapping, dancing, piano, guitar, a recorder, some clogging, and a little bit of air drumming. AP Psychology teacher James Hrzina & his wife, history teacher Oly Norris and his family, & ASB student Jack Read volunteered to be the judges for this event. They watched every act, taking notes. To start off the night, a group three of seniors, Dylan Herrera, Mike Sturman, and Ben Ct, performed an original rap on economics, the social science. Next, a group of four seniors, McCall Roy, Lexi Dean, Rebecca Lampl, Sophia Scholl created a human table while junior Brooke Jenkins, ate spaghetti off them while French music played in the background. Seniors, Sarah Rapp and Summer Terry, showed off a dancing and cheer performance. Another senior, Lanie Weingarten did a singing performance. Freshman, Joey Morello played the piano with a twist, blindfolded. Morello, known from his lunchtime performances on the painted piano on campus, received many cheers from the crowd. After, Elizabeth Hazard, sophomore, did a surprising act as she clogged along to “Havana” by Camila Cabello. Senior Caeden Schlosser, air drummed, whilst being perfectly on sync to junior Tyler Brown’s actual drumming behind the curtain. This duet made for an entertaining skit. Two more students, Louis and Troy Eaton, performed a singing and piano duet. Nina Tartibi gave an awestrucking performance on the recorder to “Hot Cross Buns.” She wore a purple wig, and even did a spin. Shayna Dumont, sophomore, sang a beautiful song leaving shocked faces in the audience. Right after, another senior duo, Josue Vasquez and Arianna Anaya, performed a song with singing and an electric guitar. Another pianist, Mitchell Oeth, sophomore, entertained the audience with a happy, light tune. The hosts excellently entertained the crowd between acts with an intense game of rock, paper, scissors ending up with five winners, each given candy bars. While the judges discussed the acts and choose a winner, two Comedy Sports members, entertained the audience with funny, interactive games. Long awaited, the judges returned to the stage with their results. The first place prize of a donut or bagel party for their homeroom was on the line. All the acts lined up on the stage, hoping to hear good new. An ASB member then announced the results. Third place: Arianna Anaya and Josue Vasquez with their singing and guitar duet. 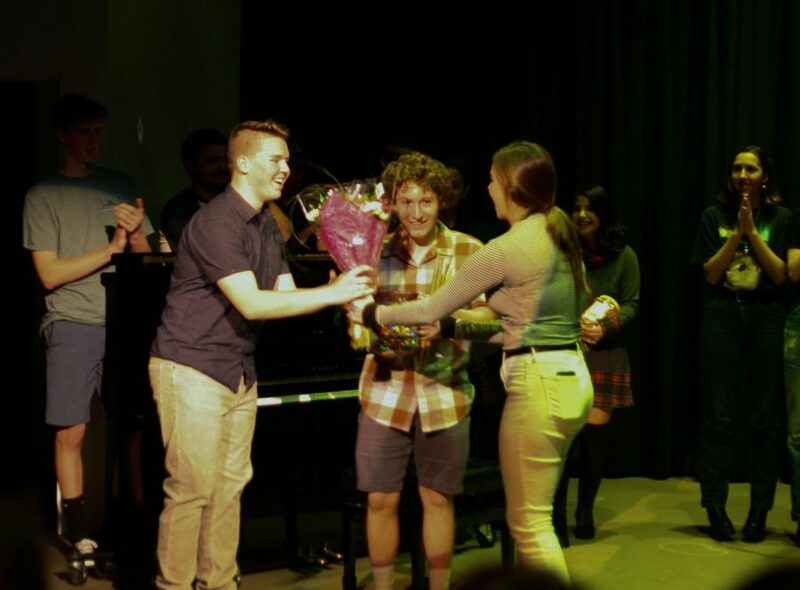 Second place: Louis Casillas and Troy Eaton with their singing and piano duet. First place: Caeden Schlosser and Tyler Brown with their invisible drum comedy performance. Although there were some accidents, like losing a hat or forgetting a dance move, the show was a success.